Comments: The Strecker’s chorus frog inhabits the Red Hills in Barber and Harper counties. The chorusing calls of this frog occur in pools during the breeding season from February through March. Reproductive success in temporary pools used for breeding sites is often high because these habitats have no predatory fish. A female attaches small clumps of eggs to aquatic plants and twigs. 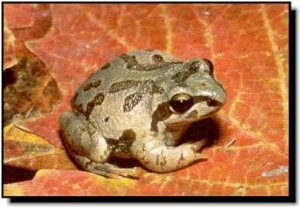 The Strecker’s chorus frog is the largest and chunkiest of our chorus frogs. There is a dark line from snout to shoulder that sometimes continues along the side as spots. There is a dark spot below the eye in most specimens. Its call is a single note, clear and bell-like in tone, that is quickly repeated. A chorus is said to sound like a rapidly turning wheel in dire need of grease. It was named after the noted Baylor University naturalist, John K. Strecker.